Preheat oven to 350 degrees. Melt butter in large saucepan. Add mushroom caps and toss to coat in butter. Sprinkle lightly with salt and cook for 1 minute. 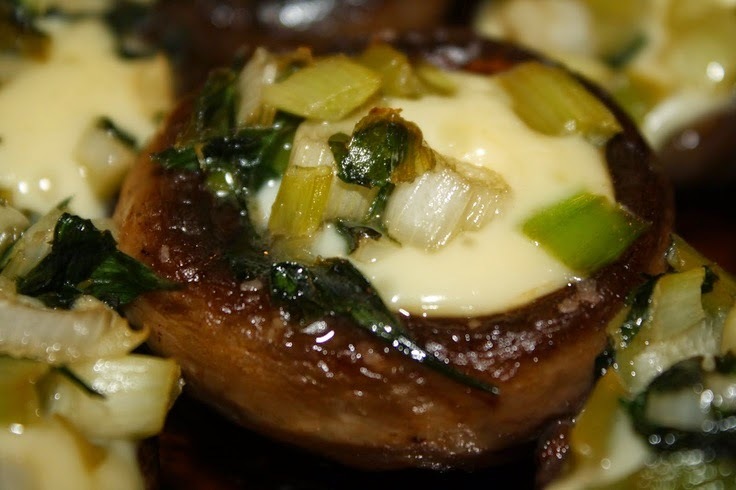 Remove mushrooms from pan and place upside down in a baking dish. In the same saucepan (without cleaning it) throw in garlic, parsley, and green onions. Sprinkle very lightly with salt and splash in wine, if using. Stir around until wine evaporates, about 1 minute. Remove from heat. Cut rind off of brie wedge, then cut pieces of brie to fit each mushroom cap.